The International Charter for Space and Major Disasters (https://disasterscharter.org/) is a means for space agencies around the world to help with disaster monitoring by providing satellite data to responders and scientists on the ground. The charter was invoked for recent eruptive activity at Kīlauea, and numerous space agencies are providing satellite imagery that HVO scientists are using to help evaluate eruptive activity. 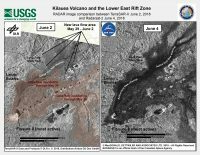 In this example, high-resolution radar data from the German TerraSAR-X satellite acquired on June 2 (left) and from the Canadian RADARSAT-2 satellite on June 4 (right) show the area of the fissure 8 lava flow, which appears as a darkened area in both images. We are grateful to our colleagues and partners at space agencies worldwide for their help in better tracking activity at Kīlauea. Beginning on June 3, lava from fissure 8 entered the ocean at Kapoho Bay. By June 6, lava had completely filled Kapoho Bay and built a delta that now extends over a mile from shore. 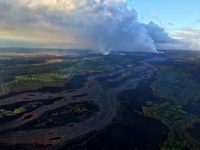 A helicopter overflight of Kīlauea Volcano’s lower East Rift Zone on June 6, 2018, around 5:00 pm.m HST documented lava-seawater interactions at the ocean entry and the formation of a white plume called laze. Lava entering the ocean builds a platform of new land known as a lava delta. This new land appears stable, but hides a foundation of loose rubble that can collapse into the ocean. This is a Civil Defense Message for 7 p.m., Wednesday, June 6, 2018. 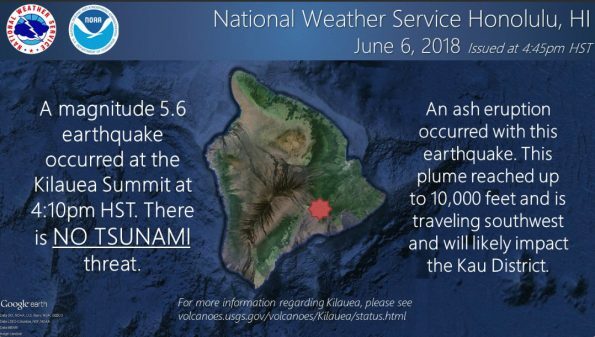 Hawaiian Volcano Observatory reports an eruption at 4:10 this evening at the Kilauea Summit resulting in a 10,000 foot high ash plume. 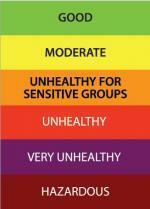 The National Weather Service is reporting slow, easterly winds over the next two days. 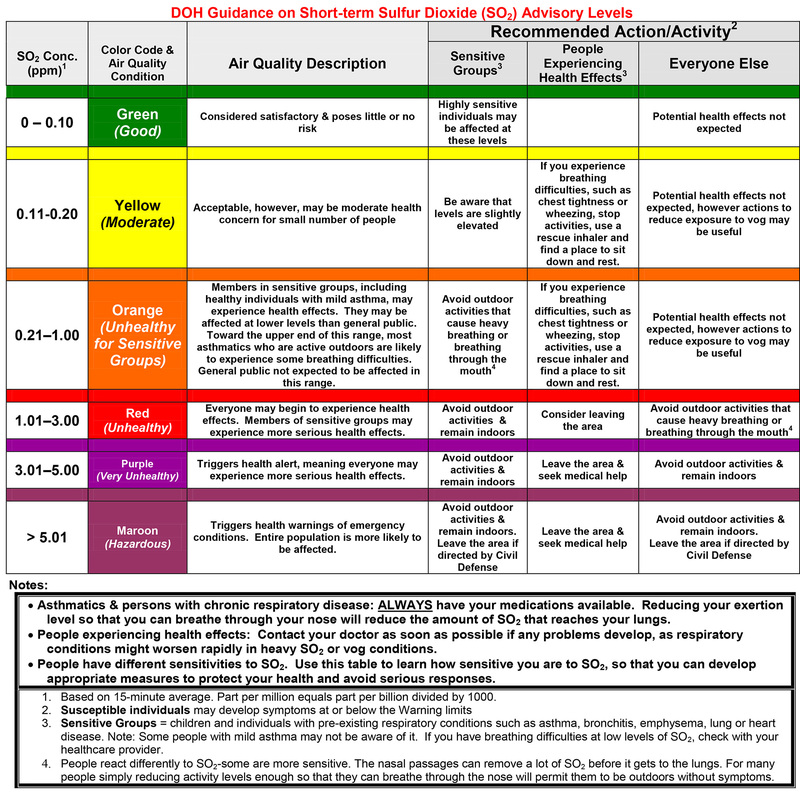 Volcanic gas output and ash emissions may affect air quality across the central and southern half of the island. Take action to limit further exposure. A community meeting on volcanic ash and VOG will be held at 7 p.m., tomorrow, Thursday June 7th, in Volcano at the Cooper Center. You can monitor volcanic gas levels on Hawaii Island by visiting the Civil Defense website or go directly to www.epa.gov/kilaueaairdata. 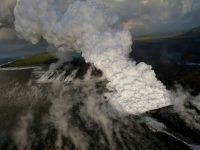 Hawaiian Volcano Observatory reports vigorous lava eruptions continue in the lower East Rift Zone. The Fissure 8 flow has filled Kapoho Bay and is extending .7 miles from shore. The Keaau Armory shelter has reached capacity. If you need shelter, the covered court at Pahoa Community Center is open and pet-friendly. 5:30 p.m., Wednesday, June 6, 2018: An ash and vog community meeting will be held at the West Hawaii Civic Center Council Chambers. HVO’s mid-day overflight on June 5 shows ongoing partial collapse of Halema‘uma‘u at the summit of Kīlauea Volcano. To the north of the former visitor Overlook parking area (closed in 2008) is the site of the former lava lake—now a deep hole piled with wall-rock rubble. The western portion of Halema‘uma‘u has moved down and toward the center of the crater as new cracks form on the caldera floor to the west. Kīlauea’s summit continues to subside due to withdrawal of magma towards the volcano’s East Rift Zone. 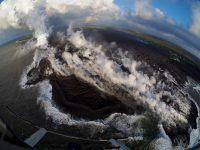 Unmanned Aircraft Systems (UAS) conducted a mission on Kīlauea Volcano’s lower East Rift Zone to collect video of flowing lava in the upper lava channel of fissure 8. Scientists use the video to assess lava flow velocities, which are measured by tracking surface features in the stationary video view. Using UAS for this type of investigation has many advantages because the aircraft can hover above hazardous areas and it utilizes stabilized gimbals and mounts so that the video captured by onboard HD cameras is steady and smooth. 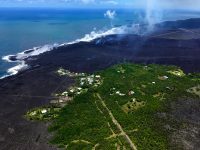 Information obtained from this mission was relayed to Hawai‘i County emergency officials to aid in issuing emergency alerts and notices about the timing of evacuations. 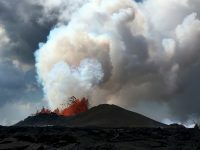 Video by the U.S. Geological Survey and Office of Aviation Services, Department of the Interior, with support from the Hawaiian Volcano Observatory.